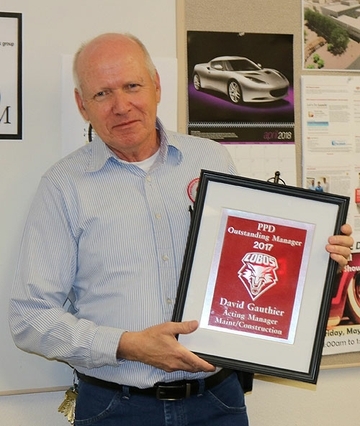 David Gauthier, acting manager of The University of New Mexico’s Physical Plant Department Area Four, was recently presented with the 2017 Outstanding Manager award. This award was presented to Gauthier by PPD Director Al Sena and its senior management team. David Gauthier was the 2017 Physical Plant Department Outstanding Manager award recipient. Compassionate and understanding with customers concerns, and being open-minded to listen to and process new ideas from his crew were just some of the attributes used to describe Gauthier on the nomination forms. “David promotes a positive work environment through mindful listening and clear expectations, which aids in promoting growth within the organization,” said Vince Chavez, facilities maintenance manager, during the awards presentation. Gauthier received a personalized award, and in the coming weeks, the plaque hanging in the Service Building will be updated to include his name as the 2017 recipient. In 2016, the Physical Plant Department formed a committee to develop a rewards and recognition program for staff. Those recognized for this award demonstrate the qualities of outstanding leadership, customer service, promoting a positive work environment and making a significant contribution to the success of their work groups. The inaugural award was given to Michael Crocker, manager, HSC Custodial Services.